Can you steal the show? and he won't tell me which! What show is my friend going on? 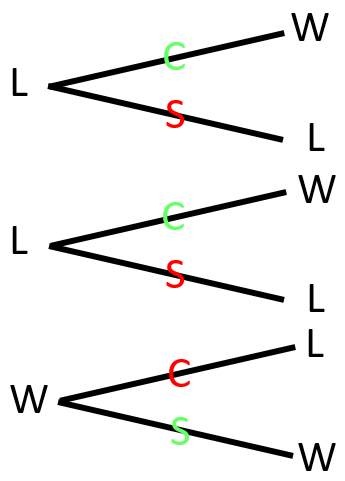 W and L denote winning and losing doors; C and S denote changing door and staying with the same door; and the fact that following "C" edges leads to two W and one L, while following "S" edges leads to two L and one W, indicates that when Monty opens a losing door you should then change to the other one. Not the answer you're looking for? Browse other questions tagged reverse-puzzling or ask your own question. Cheating is efficient, but only until you get caught! What kind of puzzle is solved by these sequences of numbers?